Children all over the world have at one point or another idolized a person. For some, it could be their parents, mentors or even their friends. On the other hand, some people chose to look up to men in tights, red cape and those that are found in the pages of comic strips. But have you ever imagined a world without superheroes? Fortunately, you don’t have to; because the great minds of these 10 illustrators and artists have given life to the fantastic characters we’ve all grown up with and loved from our childhood. Akira Toriyama is the creator of one of the most popular manga of all time – Dragon Ball. If you’re familiar with the names Son Goku and the term super saiyan, always remember that these ideas were the brain child of this man. Toriyama was born on April 5, 1955 in Nagoya, Aichi in Japan. Before creating the Dragon Ball series, Toriyama was first known for Dr. Slump which earned him the 1981 Shogakukan Manga Award for best shonen or shojo manga. Based on past interviews, Toriyama says that Osama Tezuka’s Astro Boy and Walt Disney’s 101 Dalmatians were a few of his inspirations that influenced him in creating the characters in his manga creations. Michael Joseph “Mike” Mignola is the American creator of the popular comic book series Hellboy. He was born on September 16, 1920 in Berkeley, California and began his career in the comic book industry in the Comic Reader. Throughout his career, Mignola has helped define different characters in the comics industry through his works on various Marvel and DC titles including Daredevil, the Incredible Hulk and the Rocket Raccoon series among others. If you’re a fan of Al Simmons and The Spawn then you should definitely thank Todd McFarlane for creating this character. Born on March 16, 1961 in Alberta, Canada, McFarlane first created the character of the Spawn during his teenage years perfecting all the visual elements of the character’s design. However, McFarlane went to a different path during his college years when he went to Eastern Washington University through a baseball scholarship. Only after suffering a career-ending injury in his junior year did he decided to focus on drawing, which eventually worked for the better as this shift in career gave him much success through his art creations. Aside from the various awards and accolades that he received for his works, he has also made a name for himself as a toy designer and entrepreneur creating his own line of toys and a film and animation studio. Martin Nodell was the American cartoonist that created one of DC Comics’ most popular characters – Alan Scott a.k.a The Original Green Lantern. Nodell was born in Philadelphia Pennsylvania on November 15, 1915 and began his career as a freelancer right after he graduated college. Aside from his work on the Green Lantern series, Nodell also made illustrations for other characters including Captain America, the Human Torch and the Submariner. Martin Nodell was nominated for The Will Eisner Award Hall of Fame in 2011, five years after his death on December 9, 2006 at the age of 91. Harry Lampert was born in New York and started his career under the guidance of Max Fleischer where he helped inked and produce classic cartoon characters including Betty Boop, Popeye and Koko the clown. However, his most notable work was that of the DC Comics superhero the Flash which made its debut in 1940 in the Flash Comics #1. He also created the comic book characters The King, Red, White and Blue, and the Atom. Lampert retired in 1976 and chose to write many instructional books on the game of contact bridge. He died on November 13, 2004 in Florida of complications from prostate cancer at the age of 88. Of course the childhood superhero for most girls would probably be Wonder Woman. And if you don’t know Diana of Themyscira that well, you might be surprised to know that Wonder Woman was in fact created by a male psychologist in the name of William Moulton Marston in 1941. Marston was born in Saugus, Massachusetts on May 9, 1983. He received his Ph. D. in Psychology in 1921 from Harvard University and went on as a professional psychologist even inventing several psychological tests such as the systolic blood pressure test which became one of the components of the modern polygraph or lie detector. Marston was also a skilled writer of essays and an advocate of women empowerment. This was one of the reasons why he created Wonder Woman. Together with the persuasion of his wife Elizabeth, Marston decided to create a superhero that fought with love instead of the usual representation done by superheroes at that time. For most people, the character of Marvel Comics’ Spiderman was the sole creation of Stan Lee. But the truth is, Spiderman was co-created by Stan Lee and a certain Steve Ditko. Stephen “Steve” Ditko was born on November 2, 1927 in Johnstown, Pennsylvania. He then moved to New York where he began his illustrating career working in the studio of Joe Simon and Jack Kirby as an inker. Ditko also worked on several characters including Doctor Strange and making significant contributions to the Hulk, Iron Man, the Blue Beetle, Question, Hawk and Dove, Shade and the Creeper to name a few. In 1990 and 1994, Ditko was inducted into the Jack Kirby Hall of Fame and Will Eisner Hall of Fame respectively. The epitome of the ultimate superhero can possibly be that of the image of Superman. With super strength, invulnerability, x-ray vision, heat vision and super speed, it is undeniable that Clark Kent’s alter ego can be considered as one of the greatest and most powerful superhero of all time. And this is of course thanks to Superman’s creator – Joseph “Joe” Shuster. Shuster was born in Ontario, Canada on July 10, 1914 to a Jewish family. Unlike most of the artists in this list, Shuster was one of a few who had legal problems with their created character. Specifically, he and his friend, Jerry Siegel who co-created the character of Superman faced legal battles concerning the ownership of the character. They eventually gained recognition and compensation for the creation of Superman. He then continued drawing comics but was mostly unsuccessful possibly because of his deteriorating eye sight or due to his decision to change the comic genre he was drawing for. Joe Shuster died at the age of 78 on July 30, 1992. Bob Kane was the American comic book artist and writer, who with Bill Finger created the character of Batman. Kane, who was born as Robert Kahn in New York on October 24, 1915 graduated from the Cooper Union (Cooper Union for the Advancement of Science and Art) sometime in 1934 before he became a trainee animator in Max Fleischer Studio. Three years later, he and Bill Finger created the character of Batman in response to the growing need for superheroes in the wake of the rise to popularity of Superman in Action Comics. Aside from Batman, Kane also enjoyed a career in TV animation creating several characters like Courageous Cat and Cool McCool. 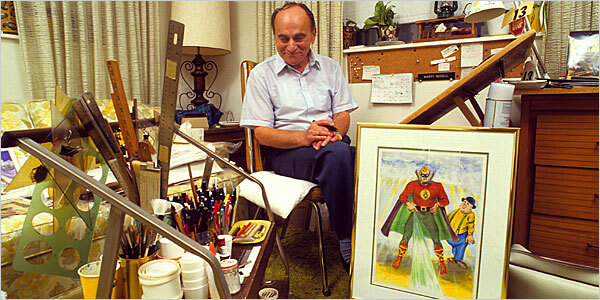 Bob Kane was inducted into the Jack Kirby Hall of Fame and Will Eisner Hall of Fame in 1994 and 1996 respectively. He died on November 3, 1998 from natural causes. Jacob Kurtzberg more popularly known as Jack Kirby was born on August 28, 1917 in New York. He first entered the comics industry sometime in the 1930s doing newspaper comic strips and single panel advice cartoons for a local newspaper. When World War II broke out, Kirby was drafted into the U.S Army where he served as a scout drawing reconnaissance maps and pictures. After the war, he returned to doing comics for several publications which eventually paved the way for the creation of the numerous superheroes including the Fantastic Four, Captain America, the Incredible Hulk, Thor and the original X-Men. With an impressive portfolio of characters under his belt, Kirby received a number of awards throughout his career. In 1967 he was awarded the Alley Award for best pencil artist. He also received a Shazam Award for Special Achievement by an individual in 1971 for his Fourth World series and was inducted into the Shazam Awards Hall of Fame in 1975. Moreover, the Jack Kirby Awards by Amazing Heroes magazine and the Jack Kirby Hall of Fame were named in his honor. Jack Kirby died at the age of 76 due to heart failure on February 6, 1994. So there you have it everyone. Which of these 10 industry legend was responsible for your childhood hero? Do tell us by leaving a comment below.